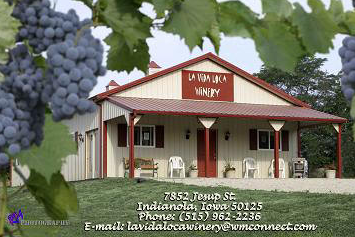 Back Roads wine trail includes four wineries on, or around Highway 92 southeast of Des Moines, Iowa. The wineries are Annelise, La Vida Loca, Grape Escape, and Nearwood. Each winery has it’s own story, ownership, and products. Back Roads Wine Trail isn’t a club or organization. It’s just growers and wine makers who have a passion for producing something worthwhile, local, and really good. The common thread is that each winery owner wants to invite you and other wine tourists to enjoy the fruits of their labor (pun intended) by offering great Iowa wine to those that seek a different experience. Contact individual wineries with questions. For questions about this wine tour email Nearwood Winery or call 641-891-2469.